Puno is at about 3800 meters, which is 12.000 feet so we were even higher than in Cusco. 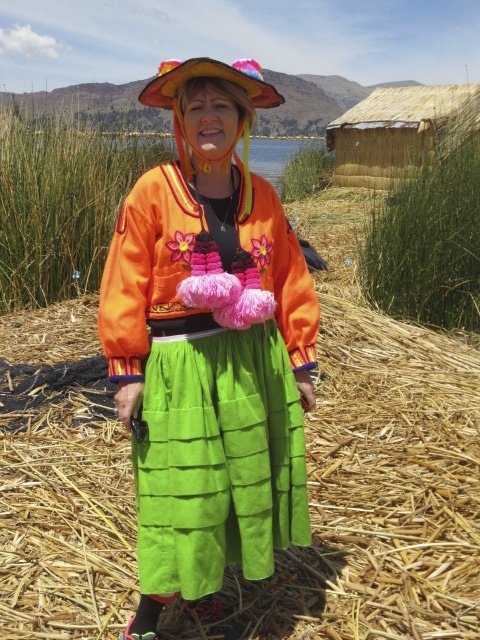 The thing that attracted us to Puno was Lake Titicaca and the floating islands. The floating islands called Uros, are man made island that people live on. We went onto one of the islands and saw how a family lived. They showed us their clothes, their house and their boat, that we got to go on and sail around in. That was really fun to see and we learned a lot about their lives and what I found the most interesting was how simple it was. Our Cusco hotel hadn't been so great so we decided to stay at a nice one in Puno. 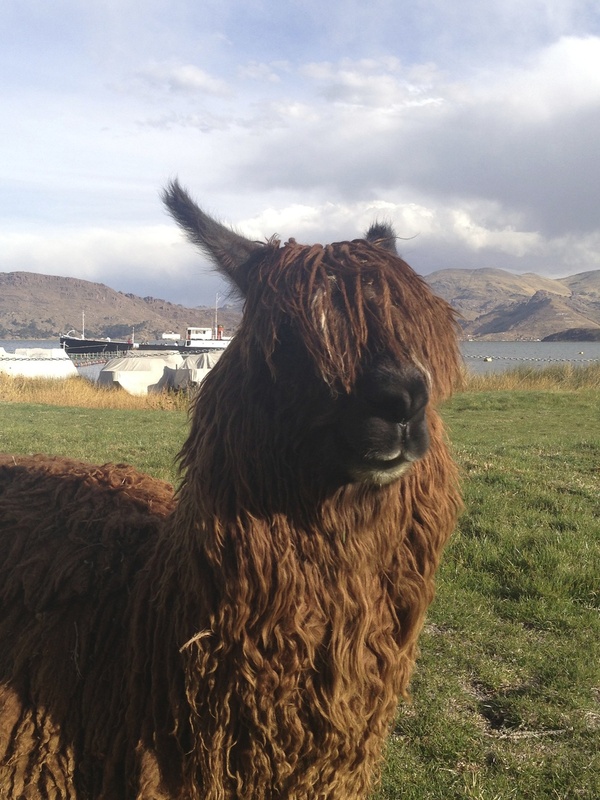 The funny thing about that hotel was that there were alpacas and guinea pigs all over the back garden. It was quite weird because guinea pigs are house pets in Europe so I wasn't used to seeing them running around. It's probably a lot more fun there than locked up in some cage especially because there was no threat against them in that garden. It was also fun to be able to go out and be with alpacas whenever you liked. Alpacas are very funny animals and I got some very good pictures of them. We had been doing so much the last week that we just relaxed most of the time we were here. On our last full day in Puno there was a strike downtown. The miners came and were complaining about getting to little money for their work, similar to what we'd seen in Cusco. We tried not to be right in the action, not that I didn't want to, it was more just that mom and dad didn't. And I understand them, I have seen the news when bad things have happened but fortunately nothing did. On the other hand, later that night we heard that there was going to be another strike and that it would be much worse that this one. The reason for the strike is pretty weird but they were going to strike against the strike that was happening the day before. We got some more information about it and learned that they were going to close down all the roads at six in the morning. We were going to take a flight at two from Juliaca that we were not going to miss so that meant that we were going to have to wake up very early. So we were up at 4:30 on mom's birthday. We left the hotel at 5:30 and even then we saw people getting ready for the strike. When we were driving we saw 5 huge cars with containers to put in front of roads so we were glad to be out of there. We were pretty shocked when we got to the airport because what was there to greet us were about 200 guards. There were some on the roof with guns, others standing guard at the gate and the rest were just walking around. It was a bit scary and it definitely woke you up! As we were waiting for our plane more guards came. Policemen, army guys and guards in big cars with all sorts of weapons. By the end there were between 500 - 600 guards of some sort just in that tiny airport. It was good to know that we were well protected and all but it became pretty creepy. It felt like we were in a movie or traveling with the president or something! It's at least the weirdest airport experience I've ever had.